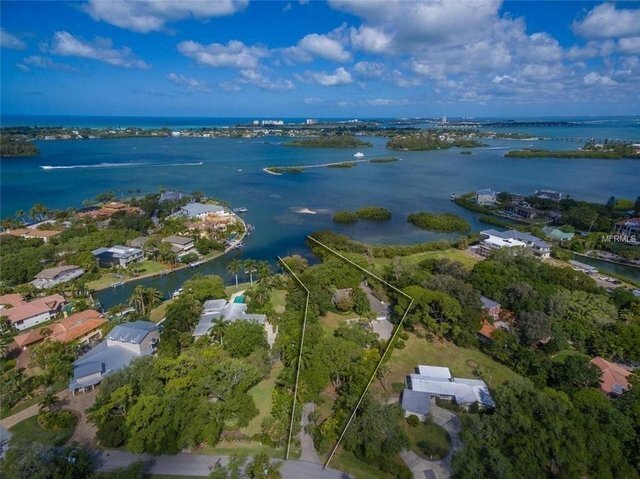 Introducing this private one-acre Old Florida style waterfront estate property with open views of Sarasota Bay in one of Sarasota's most beloved neighborhoods, Oyster Bay. This property enjoys 100 feet on the water and old Oaks and tropical flora serve as the backdrop for a charming and gracious home with mid-century influences. A gated courtyard entry ushers one into an open floor plan with walls of windows allowing the outdoors in. A major remodel was performed in 1989 which included gutting the interior, replacing the kitchen, roof, plumbing and electric. Meticulously maintained, this home has a very spacious great room, wood floors in many rooms, three bedrooms plus an office, separate dining, an eat-in kitchen, a large storage room, powder bath and an oversized two car garage. There's an atmospheric granite clad fireplace in the great room and a screened room off the kitchen perfect for entertaining a crowd. Just a couple of streets over to the Field Club. The friendly voluntary association is active with holiday gatherings and keeping the landscaped common areas looking beautiful. This is one of those once-in-a-lifetime properties. Property is being sold in as iscondition.